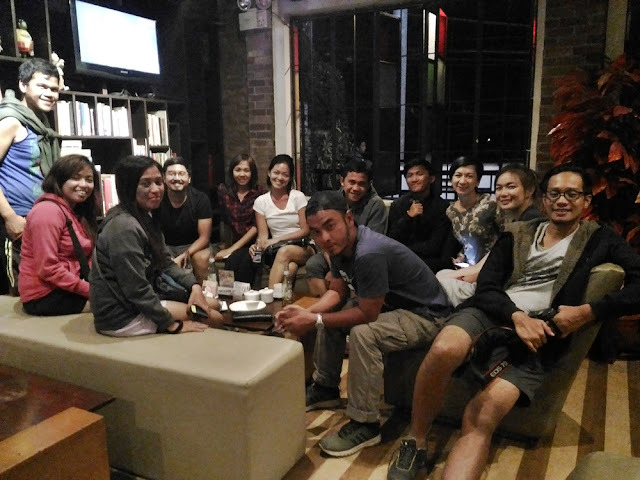 It was almost a year ago when I found a comrade-in-arms in the art of moving on. A knack – because it takes a while figuring how to pull it off, and requires keen imagination to create a way for one’s self to wiggle out. A heartache that punctures deeply and hurting necessitates a massive redo of one’s routines. A friend of mine; Cha found a progression to distance herself from that madness; by indulging in the sport of mountain climbing. Mountaineering - my first love back in college, which I had abandoned except during sporadic hiking trips that happens far in between. “You should join our next climb Marky” she told me one day. Forever looking for an opportunity to wander, I signed up with a small group of people that fits in a van – mostly her friends and a few other joiners; some cheery chaps and ladies from DIY Travels. 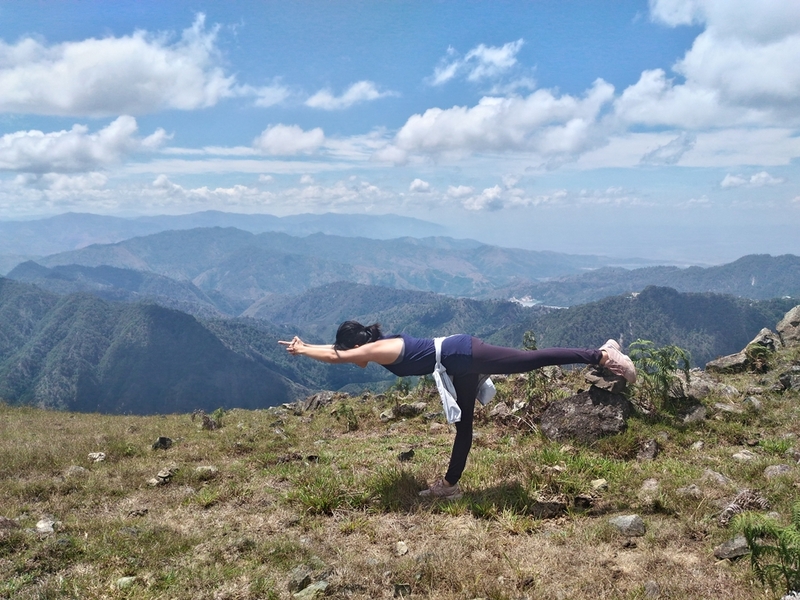 Since her own break-up, Cha has scaled five mountains and counting at that time, while my last climb was at Mount Pulag - a year before with the ex-girlfriend. This made the trip invite from Cha a wonderful opportunity for myself to create a space fodder to separate that memory with a new one; this time with old and new friends alike. 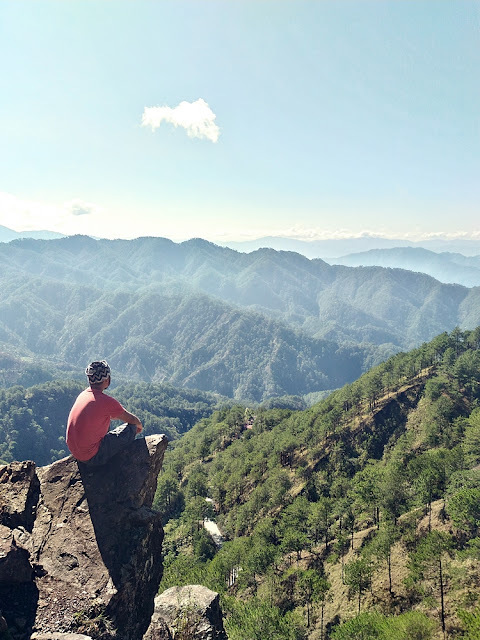 As a man back in singlehood – ascending the trails of a place fittingly called Mount Ulap, I am also bringing a version of myself ripe for breaking out of a cracked shell. A few from our group were first time hikers, and they pulled it off easy. 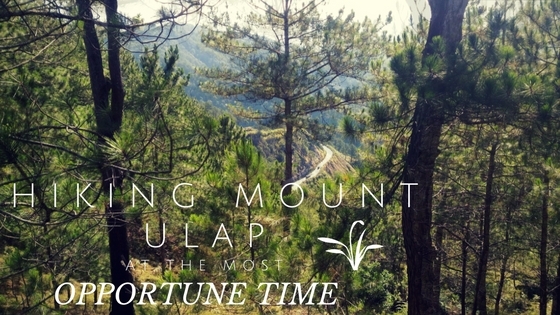 The jump-off of Mount Ulap is at Brgy. Ampucao, Itogon, Benguet and caters to mostly beginner hikers – which appealed to myself who at that time, was just beginning a comeback trail at the gym and hasn’t built up stamina and endurance yet. An easy climb is what I yearn for. 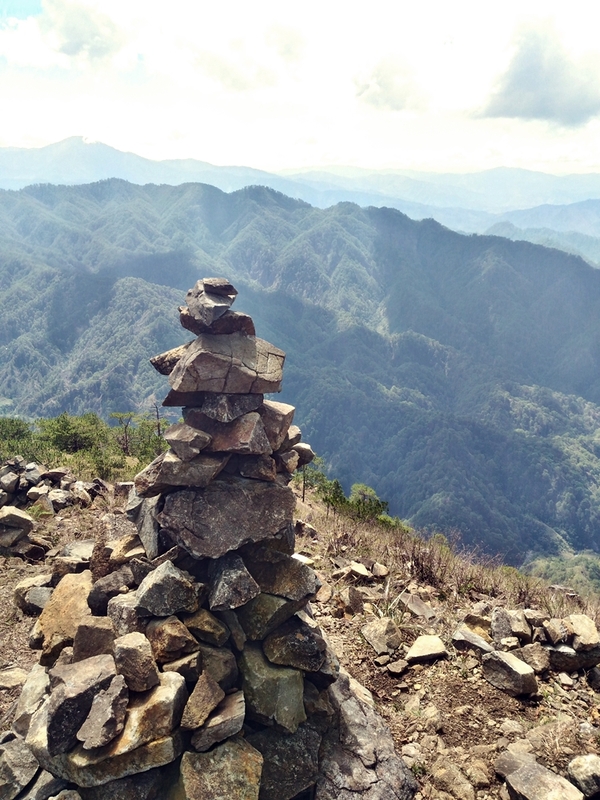 Our guide promised us “five to six hours of trekking starting from Ampucao to Sta Fe Ridge, completing a traverse”. 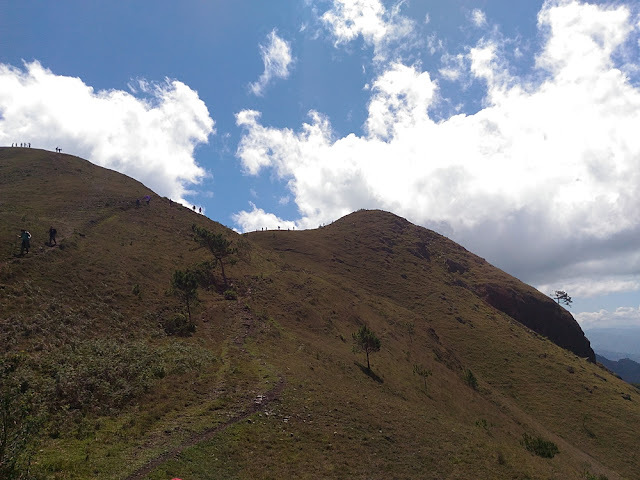 Most mountains offer a more difficult traverse route, but at Mount Ulap – descending on the opposite trail is the easiest and afford climbers to cover more scenic spots. “It is going to be a chill hike, the five hours already includes rest stops and picture taking time” he tells us. Our trail started at a blistering stride until our guide reminded us to take it easy. As if saying “slow down and smell the flowers” – we switched our hurried steps into dawdling paces and as soon as we took it slow, the spectacular nature surroundings revealed itself to me. 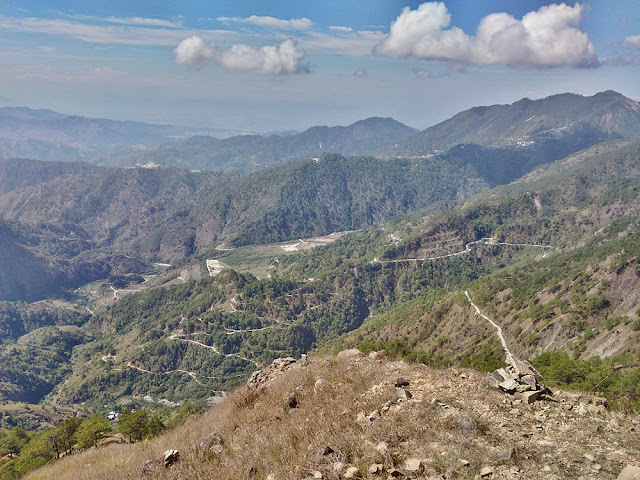 The best the Cordillera Mountains are known for; towering pine trees, swaying green grasses and rolling hills – all colluding to form a postcard-material scenery - quickly arrested my attention. Our hiking trip to Mount Ulap has started to unveil itself as one great gig in the sky indeed. 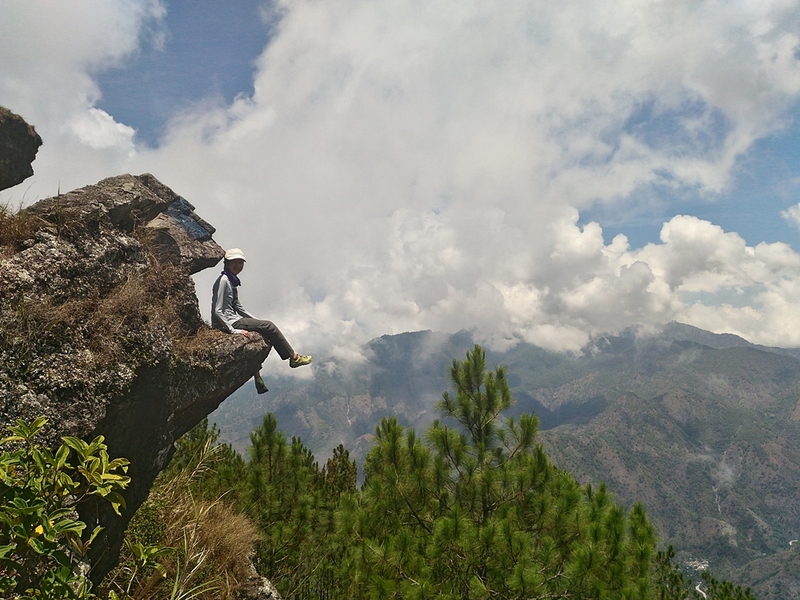 After less than an hour we reached a saddle with a protruding boulder where one can sit and stand while staring at the vast greatness of the outdoors. On the far right side one can see the mining town of PHILEX and the community surrounding it. We rested and took our sweet time taking photographs on the rock, which reminded me of the kind of backdrop the young Jack Kerouac might have gazed at, while he worked as a fire lookout at Desolation Peak in the North Cascade Mountains of Washington State. “I could stay here the whole afternoon and pretend to be good ole Jack” I thought to myself. “With this kind of view, creative juices shall flow like wine inside my mind” and before I could entertain the idea of excusing myself from our group and opting to stay, our guide motioned to us to get moving. 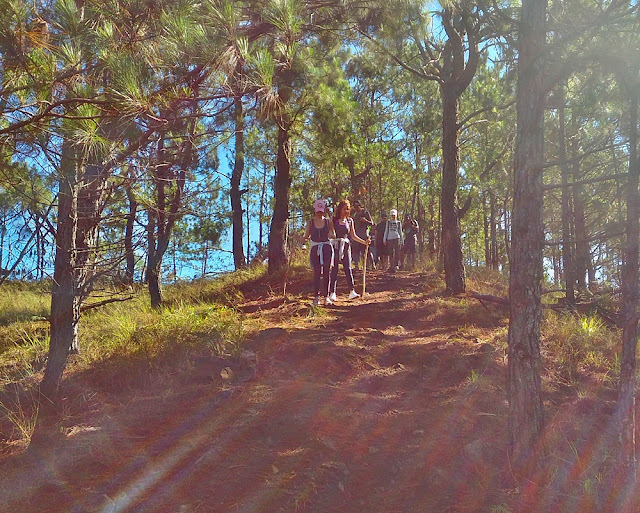 An hour of slow hiking later, we exposed ourselves to an open space of lawn-covered hills and away from the canopy of pine trees. The change of landscape meant feeling a stronger gust of wind blowing from all direction. The highland weather just became cooler. We negotiated various snaking path uphill into Ambunao Paoay, where we saw scattered loose rocks piled up on top of each other in a pyramidal shape. A lone tree stands offering a miniature shade but we all chose to be showered by the gleam of the sun and once again stared at the distant gifts of Mother Nature. We took a minute to pose for a group photograph. And as Cha was setting up her iPhone she directed us to “make continuous movements”, it turns out she’s using an app called Boomerang. A little further ahead, we finally reached the popular landmark at Mount Ulap; Gungal Rock. A massive slab of rock that sits on the ridge overlooking a dropping ravine. Perfect for some daredevil photo-op, it usually attracts a line of hikers stopping by here for a prolonged time. As big as Gungal Rock, the insects flying around also boasts of a humongous size that it looks a steroid version of blowflies. It quickly covered the cap I was wearing and it obviously bothered the rest of us – forcing us to take photos at Gungal Rock in a hurried pace. 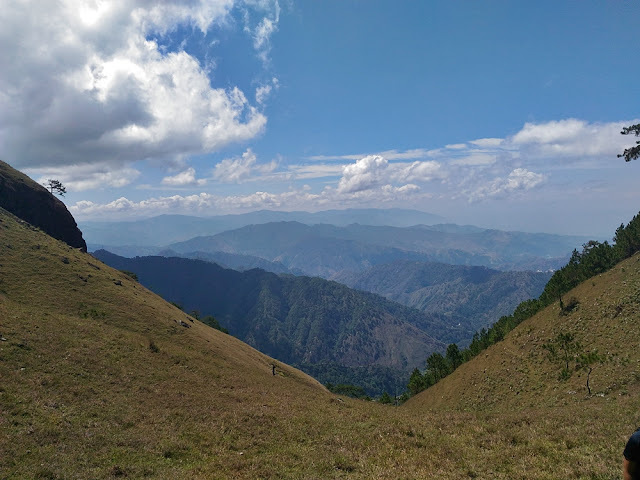 The last part of our hike took us to the peak of Mount Ulap and into the vast downhill stretch of the rolling hills. At the top, we all took a much needed rest. As Tanya practices her yoga poses, I sat over a patch of grass and once again directed my gape at the vast adjacent highlands. After a lengthy moment of being isolated with my thoughts, I stood up to gather my backpack. About the same time, I sensed the signal coming from our guide to proceed. I took first dibs in attempting a downward dash towards the camp site. The steep hill – angling at almost 45 degrees, proved to be a bit difficult to negotiate. With gravity pulling me down, I summoned my legs to run at a faster pace, while knowing fully well that I could break my ankle in the process. Fortunately, I reached the camp site with my two feet still standing, glad that only my Merrell shoes suffered the inconvenience of being covered with grass and cow dung. Our traverse was supposed to take us also to the Pong-ol Burial Caves, but during that time the trail that leads to the caves was closed for some restoration work – so we ended up hurrying our trek back to the town. The whole day-hike seemed to be a wonderful departure from my usual travels. I feel like being charmed back into the activity of hiking and still feeling strong afterwards, I believed I could still take a shot at another mountain. More importantly, I started seeing life as clear as the azure skies that prevailed that day. I met new friends and saw how the beautiful nature make up the rest of my world. ‘How could I go mad at this beautiful world?’ I asked myself. I have to admit, I have gotten the blues over and again after that day. However, our little gig at Mount Sky delivered me an effective drug that helped me heaps in moving on.